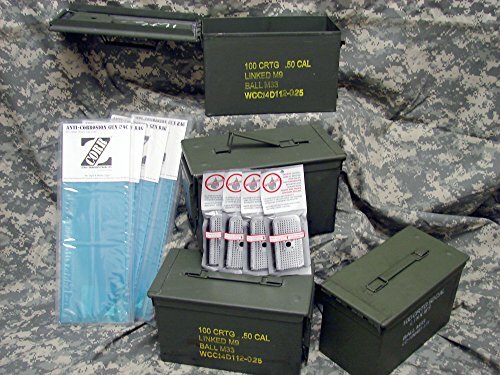 4-pack of military surplus 50 cal ammo cans equipped with ZCorr vapor corrosion inhibiting liners sized to fit the cans and 40g silica gel desiccant packs for humidity control. The Cans are in good to very good servicable condition. Cans may have scratches, dings, exterior spot rust at corners or at wear points, rare spray paint over markings, etc... typical of military surplus. We use nicer cans for these kits. We rinse/wipe the exteriors and check gaskets and interiors to be free of rust. Kits come with a humidity indicator card. Desiccant packs have built-in indication of humidity saturation. A great storage solution! If you have any questions about this product by ZCORR; Hydrosorbent, contact us by completing and submitting the form below. If you are looking for a specif part number, please include it with your message.